The Thief's Downfall is a waterfall that protects treasures hidden underneath Gringotts Wizarding Bank. It is one of the many defensive enchantments employed at Gringotts Wizarding Bank. 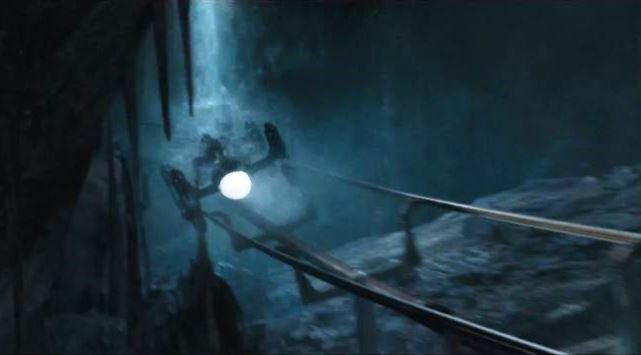 It washes away any concealment or enchantments (including the Imperius Curse) that are being used by the occupants of any mining cart that runs through it, as well as causing the cart to derail and crash, preventing the thieves from progressing any further. 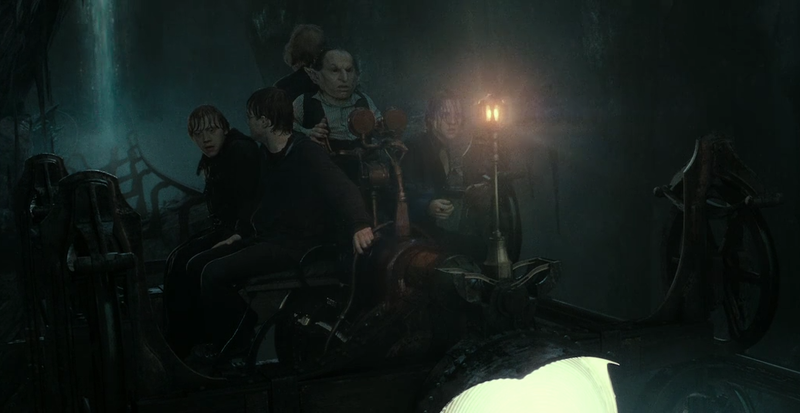 Apparently, it did not wash away the enchantment on Hermione's purse, or the purse would have burst open and spread its contents all over the mining cart. The Thief's Downfall is a very useful technique for exposing enchantments and Imperiused people. I could imagine shopkeepers installing a smaller version of it in front of their stores. Or putting one in front of the Ministry of Magic offices. Or at the entrance to Hogwarts. Or inside a cave full of dead things in the water. I would pay a goblin good gold to install a small waterfall in front of my business. I don't recall anything similar to it in the Harry Potter books. Is there any mention of anything like it? Please support your answers with quotes from canon sources. There isn’t anything else shown similar to the Thief’s Downfall. There’s nothing shown in the Harry Potter series that works like the Thief’s Downfall to break enchantments - there’s nothing known to break the Imperius Curse other than the person who’s under it fighting back. There also isn’t anything mentioned that can reveal if someone is using Polyjuice Potion until it wears off. Nothing else in the series has similar effects to this. Enchantments are shown to be breakable, but usually by actively breaking them by working against them by countering them in some way, not using something that automatically breaks them. The closest is the Taboo, it breaks enchantments once a word’s said. The closest thing is the Taboo, which breaks protective enchantments and allows people to be tracked - but with the precondition that they use the word that the Taboo was placed on first. It’s unclear how a Taboo is created, but this is the closest thing other than the Thief’s Downfall itself to “breaking many enchantments”. It’s unknown if it works to remove the Imperius Curse or reveal someone using Polyjuice Potion. However, there’s nothing else mentioned that removes unspecified enchantments automatically - they have to be “purposely” broken. Are there any talking dragons in the Harry Potter universe? What other breeds of dragons are known in Harry Potter? Why wasn't Hermione's enchanted purse affected by the Thief's Downfall? Are there any lawyers mentioned in Harry Potter? Are there unicorns in Harry Potter?